In his State of the Union address Tuesday night, President Obama will propose raising taxes on the wealthiest Americans. That plan has little chance of becoming law because Republicans are in control of both chambers of Congress. Obama’s proposed tax increases would not be on the income the wealthy earn from work (in the form of wages), but instead on their income from investments, which are taxed by the (lower) capital gains rate. Capital gains are earnings from the sale of an investment, such as a stock, bond or piece of real estate. So, if a person buys a stock for $100 and sells it a year later for $120, they are taxed on the $20 of capital gains. 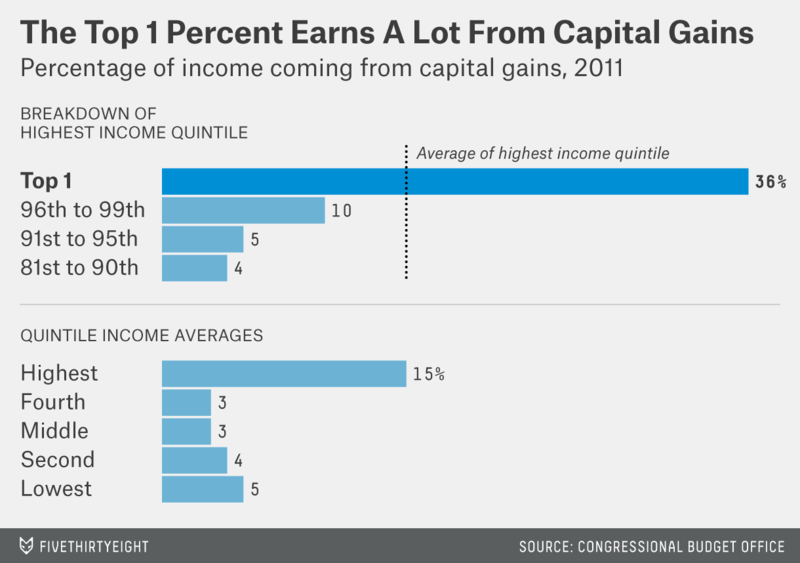 According to the Congressional Budget Office, as of 2011, the top 1 percent of income earners in the U.S. get more than a third of their income from capital gains. For context, the typical annual income for those in the top 1 percent is about $1.4 million. In earning so much from the sale of investments, the wealthiest 1 percent are an outlier: 36 percent of their income comes from capital gains. Those with incomes in the 96th to 99th percentile — who earn about $300,000 per year — only earn about 10 percent of their income from investments. That share is even lower for those below the 90th percentile. Obama is seeking to raise the top capital gains tax rate — which, for example, is paid by couples who earn a combined $500,000 or more — from 23.8 percent to 28 percent. Again, that proposal is unlikely to pass. But if it did, it would target the type of income earned disproportionately by the wealthy: income from capital, not labor.